Solution in simulation of cardiac excitation anisotropic propagation throughout the ventricular myocardium is computationally very expensive that demands the introduction of a high performance computing techniques. In this study, a canine ventricle model was constructed features a realistic anatomical structure, including intramural fiber rotation and a conduction system. By using operator-splitting scheme, adaptive time step and backward differentiation formulation techniques in a parallel implement, we solved mondomain equation successfully. The stimulation produced isochrone’s map is close to the clinical record that obtained from the non-contact mapping system of Ensite 3000. 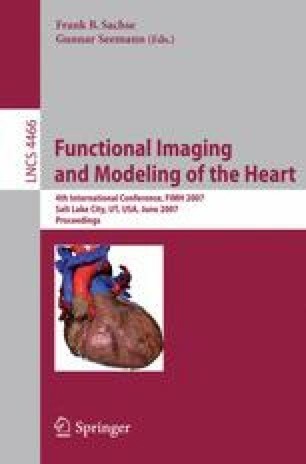 The results show that the proposed methods can successfully be used to simulate heart excitation anisotropic propagation in three-dimensional anatomical large tissue size.